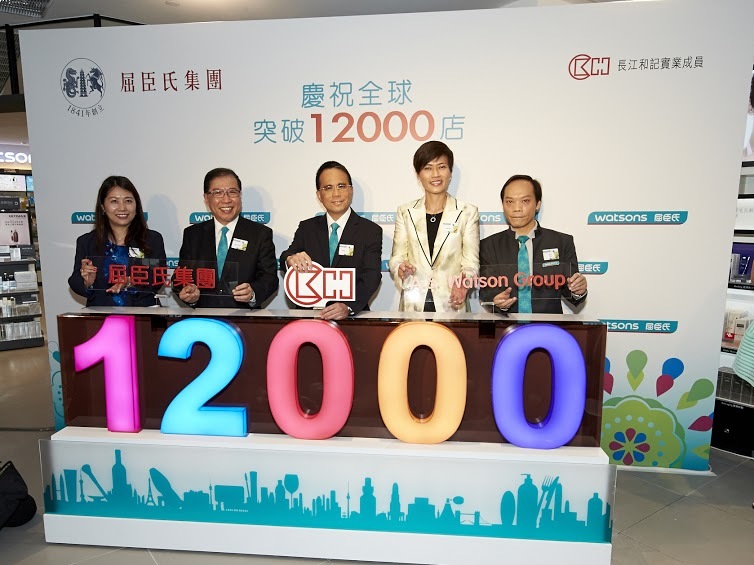 Hong Kong, 2015-8-12— /EPR Retail News/ — A.S. Watson Group (the “Group”), a subsidiary of CK Hutchison Holdings Limited(“CK Hutchison”), reached a new milestone today with the opening of its flagship Watsons store on Yun Ping Road in Causeway Bay, marking the Group’s 12,000th retail store in the world. Spanning over 3 storeys and covering an area of over 8,000 sq. ft., this new flagship store is the largest Watsons store in Hong Kong. “Last year, A.S. Watson Group opened and refitted 76 retail stores in Hong Kong; and for this year, the number is expected to amount to over 80. The capital investment involved would be approximately HK$620 million over these two years,” Mr Li added. “Next year, it will be the 175th anniversary of A.S. Watson Group. I take this opportunity to thank our 12,000 dedicated employees in Hong Kong and the long-standing support of our customers. In line with the strategic direction of our parent company, CK Hutchison, the Group will continue to expand our business in Hong Kong and contribute to the city’s prosperity,” Mr Lai added. Watsons, recognized as the No. 1 Pharmacy/Drugstore brand in Asia for 7 consecutive years, is one of A.S. Watson Group’s major retail brands. Its flagship store, located at Yun Ping Road, Causeway Bay, demonstrates the world’s latest Watsons store design concept of a contemporary and elegant style. As an all-rounded health and beauty store, the flagship store provides customers with over 8,300 unique products, including 840 healthcare and beauty brands of which 250 are Watsons exclusives. The wide selection of products are categorized into different themes, such as organic skincare products, derma cosmetics, baby care area, men’s care area, and health checks, etc. Pharmaceutical and beauty consulting services, in-store nursery room and mobile charging stations are also available to provide comprehensive customer services. About A.S. Watson Group Established in Hong Kong in 1841, A.S. Watson Group is the world’s largest international health and beauty retailer with 12,000 stores in 24 countries/ markets. Each week, over 28 million customers and members shopped with our 13 retail brands in our physical store network and on digital stores around the world. In Hong Kong, we operate over 620 stores under four retail brands – Watsons, PARKnSHOP, FORTRESS, and Watson’s Wine. In addition, we manufacture and distribute high quality drinking water brand Watsons Water as well as famous juice drinks Mr. Juicy and Sunkist. For the fiscal year 2014, A.S. Watson Group increased revenue by 6% to HK$157.4 billion. We have over 117,000 employees worldwide, including 12,800 in Hong Kong. A.S. Watson Group is also a member of the world renowned multinational conglomerate CK Hutchison Holdings Limited, which has major interests in ports and related services, retail, infrastructure, energy and telecommunications in over 50 countries. This entry was posted in Business, Healthcare, Retail, Retailer and tagged A.S. Watson Group, Watsons store, Yun Ping Road in Causeway Bay. Bookmark the permalink.